Minnow in the end has to be realistic. But in order to make an injection minnow, the form creating the long cast ability and the action balance setting must compromise. Under the conflict of clearing these conditions, the final packaging is usually undifferentiated. Every minnow somehow looks the same. Megabass minnow has pursued the flash that the fishes originally release, its limber swim, and also the panic action they show when they encounter fish eaters feeding. As a result, X-80, VISION 95, ONETEN, 120, 140 has also produced real packaging. Megabass thinks Japans small minnow must be more flat side and be full of realism. Now where there are spin drive units coming into the world, we have also reached the conclusion to increase the casting distance of the slim, native designed minnows. This is to instantly catch tough monsters using “long distance”, “Realism”, “mouthful size” as a key. 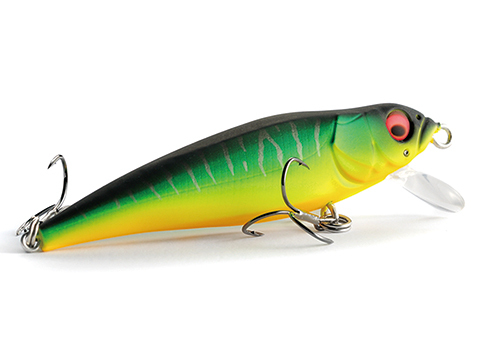 FX6.6 is a 66mm flat side minnow. At tests, it has shown amazing results. The near future Japanese minnow makes bass, large size trout, seabass, and various fish eaters go crazy. It would finally descent.